Broxted is a village and civil parish in the Uttlesford district, in the county of Essex, England. 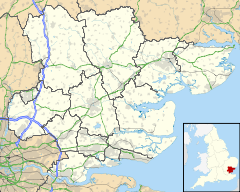 It is situated 11 km (6.8 mi) north-east from Bishop's Stortford, Hertfordshire and 23 km (14 mi) north-west from the county town of Chelmsford. The parish includes the hamlets of Cherry Green and Brick End. Broxted is in the parliamentary constituency of Saffron Walden. There is a Parish Council. According to the 2001 census it had a population of 526,[full citation needed] reducing to 508 at the 2011 Census. The village lies on the road between Molehill Green and Thaxted. It has one public house, the Prince of Wales. In the 16th and 17th centuries, part of Broxted was known as Chawreth. ^ a b "Broxted Parish Local Area Report". nomisweb.co.uk. Office for National Statistics. 2011. Retrieved 29 January 2019 – via Durham University. ^ "Uttlesford Information regarding Broxted". www.uttlesford.gov.uk. Archived from the original on September 27, 2007. Retrieved 2007-03-14. ^ "Historical Gazetteer: Broxted". www.placenames.org.uk. The Historical Gazetteer of England's Place Names. Retrieved 18 February 2016.